Meta Therapy is the new method for skin rejuvenation great for anti-ageing, skin hydration and restoration. The facial treatment can be performed on the entire face, neck, décolleté, or specific areas for overall skin rejuvenation. The skin will improve in structure, have finer pores, increase firmness, boost elasticity, and give a more youthful appearance. Dermatude is a treatment that can be carried out by therapists and presents an exclusive chance for you to offer the latest in skin enhancement in your salon, clinic, or medispa that delivers a unique treatment with fantastic results. Controlled micro perforations activate the natural regeneration of the skin and apply the exact amount of active ingredients in the layer of the skin where they can be most active. The Dermatude micro-needles are designed to channel the subjectable during the treatment directly through the outermost protective layers of the epidermis, and into the Basal cell layer, where they are most effective.  When Dermatude penetrates the skin, the microneedles create controlled damage, so that just the epidermis is affected. This creates an inflammation reaction which initiates the release of interleukins and growth factors that vastly improves the condition of the skin. Skin is firmer, fine lines and wrinkles are visibly improved, pores become refined and circulation is stimulated. As the needle depth is at a maximum of 0.5mm no anaesthetic is needed and bleeding is unlikely as there is no blood supply in the epidermis. You’re invited! Come along to one of our Discovery Days and try a treatment! The stamp head has a slightly curved shape, so all points penetrate the skin with the same depth. The module also features Flex Head Technology. 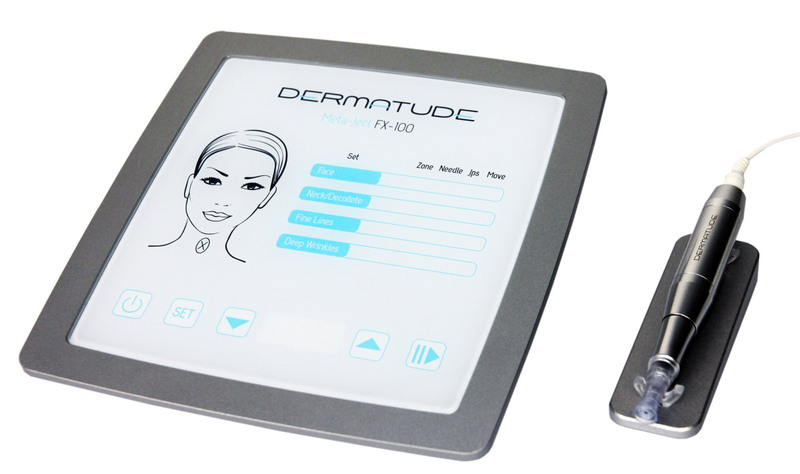 The highest European Standards are followed in the manufacturing of the Dermatude Meta-Ject FX-100 device. Dermatude is manufactured in an ISO 9001 certified facility and meets the European Union Medical Standard EN 13485. Dermatude is not just a treatment, it is a total concept which complements and reinforce each other. The device, modules, treatment, skincare products, and procedures are fully integrated with only one goal – gain the best possible anti-ageing results for your client. With Dermatude you can offer a unique service to your clientele. You will be tapping into an affluent target group of people that are concerned with anti-ageing products. 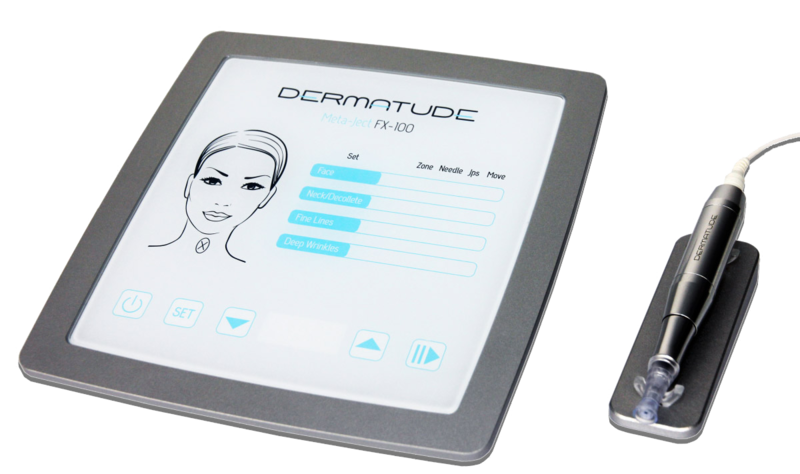 Dermatude allows you to meet the needs and demands of this ever growing and affluent client base. By furthering your education with Nouveau Skin Therapy you are investing in yourself, your career and your business. Nouveau Skin Therapy is regarded as one of the very best beauty training providers in the UK and we pride ourselves on our student satisfaction. We ensure all of our students leave with the skills and confidence to deliver amazing results for their clients. Dermatude is a one-day hands on course where our experienced trainers will lead you through both theory and practical modules, encompassing everything from the fundamentals of META therapy to tailoring treatment courses for specific client needs. There’s never been a better time to train in Dermatude, especially with our enhanced start-up kits that are now available for a limited time only. This compact device is digitally controlled and ensure perfect reset frequency. The frequency can be set from 50 to 120 Jects per second. This subjectable contains hyaluronic acid and is perfect for clients with dehydrated and mature skin. These are applied after the META Therapy treatment to soothe the skin. This package contains enough for 8 treatments. 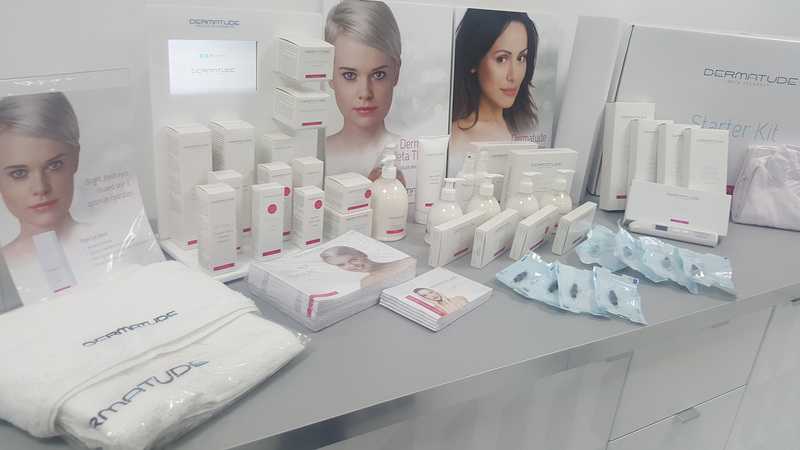 All newly qualified technicians can also take advantage of our exclusive Training Day offers on our Dermatude Skincare range, as well as treatment products.